Anti-Dairy Fight Club is what? Michael Hansen | Banner | Po Lee, chef of Teriyaki Plus in Riverside, chops cauliflower florets and inspects them with a trained culinary eye before deep frying them for vegan sweet and sour chicken. The first rule of Anti-Dairy Fight Club: Talk about Anti-Dairy Fight Club. The head of the club and chef of Teriyaki Plus is Riverside resident Po Lee. Every Sunday, Lee serves an all-vegan menu and transforms her regular business, Teriyaki Plus, into the Anti-Dairy Fight Club. Anti-Dairy Fight Club started as a solution for a scarce vegan-food scene in Riverside. Previously, Lee served small numbers of people and friends weekly, taking donations as payment. However, as the number of customers increased, Lee reluctantly started charging for food to keep up with demand. 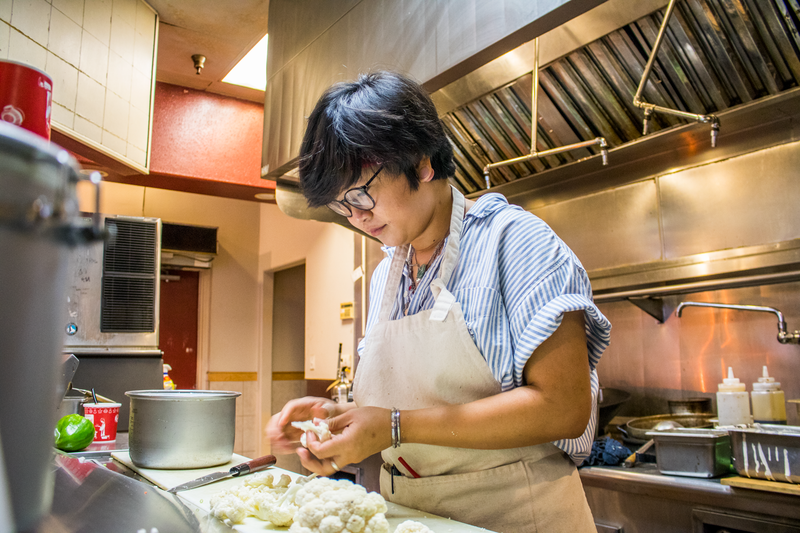 Lee is a self-taught cook and views life as a school to learn from wherever she goes. Lee immigrated to the United States with her dad when she was 9 years old, leaving the rest of her family in the capital of Cambodia, Phnom Penh. To Lee, people returning to visit Cambodia after moving to the United States looked well off, and she wanted to, as well. This experience led to Lee’s philosophy of helping people through good food and friendship. Nancy Romo, Riverside resident and employee of Teriyaki Plus, said Lee inspires her to be a better person and is a friend she can always go to for advice. David Perde, junior Christian studies major at CBU, said he was won over by Lee’s restaurant. “The made-to-order style and open kitchen create an illusion of having your own personal chef,” Perde said. Lee said she prefers to push the boundaries of her creativity with food and fashions an original menu every week for the Sunday transformation of her restaurant. Past menus have showcased mushroom soups and savory, sweet-and-sour fried orange cauliflower accompanied with Asian classics, such as vegan pot-stickers and egg rolls. Meals typically cost $10, but if a customer is short on money, Lee said she does not mind compromise. When not hosting Anti-Dairy Fight Club, Teriyaki Plus offers many traditional Asian cuisine dishes, including teriyaki chicken, kung pao chicken and orange chicken — made to order. Andrew Pirkle, junior applied theology major, said he eats at Teriyaki Plus and enjoys the quality of the food. His favorite dish is the vegan orange chicken. Teriyaki Plus is located at 7120 Indiana Ave. in Riverside and is open Monday-Friday.